There has been some serious garden activity in the past few days. The outside garden is planted. We mulched the garlic the other day, and the green plants coming up between the rows of varied lawn waste is a beautiful thing to behold. The different sorts of leaves and clippings that come in the bags we get from the City of Hancock make an interesting mosaic when they are emptied between the rows of plants. The outside garden also has rows of onions and potatoes, besides the garlic. The fallow half of the outside garden is planted in buckwheat, and we’re waiting anxiously for the first shy plants to poke up. 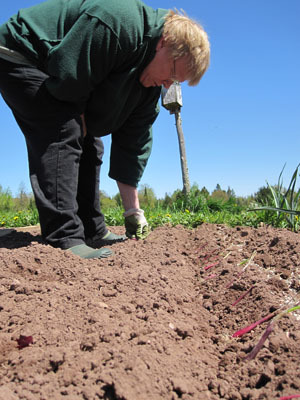 We also planted onions in the greenhouse garden. These are the sweet onions called Aisla Craigs. We’ve had good luck growing them over the years, and they also store well in our dirt-floor basement. In fact, we are still using last year’s crop of the sweet onions, which is amazing. 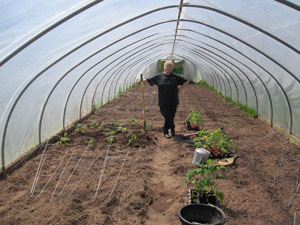 We also got the tomatoes planted in the greenhouse. 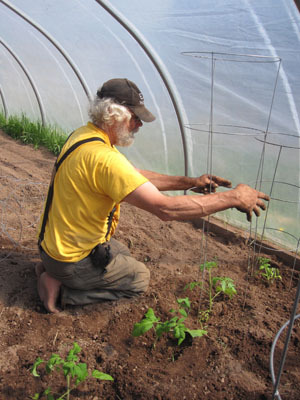 Alice and I have a good system for getting our hand-reared tomatoes into the ground. I dig four holes with the shovel, and she follows behind me with the watering can, and fills the holes with water. I then put the plants in the hole and cover them with dirt. (Needless to say, this is a very dirty job. I get mud and dirt all over myself.) I sculpt a water-holding basin around the little plant, put a tomato cage over it, which Alice has staged just behind me, and then move on to the next hole. We planted 32 tomato plants this year. We also planted our acorn squashes. We actually planted the acorn squash seeds while we were on our motorhome trip earlier this month, which may sound a bit surprising. On a shopping stop at the Meijer’s in Charlotte, MI, I picked up some peat pots and a packet of squash seeds. I borrowed some potting soil from my Mom’s stash and planted 8 seeds in the peat pots. These we stuck in one of the basement cupboards on the motorhome, and pretty much forgot about them. When we got home we kept them watered, and by golly, 4 of them sprouted. So in our acorn squash hills, there are actually plants coming up… in May! If this works, we may start many more of our plants in peat pots earlier in the season. This entry was posted on Saturday, May 31st, 2014 at 6:14 pm and is filed under Uncategorized. You can follow any responses to this entry through the RSS 2.0 feed. You can leave a response, or trackback from your own site.